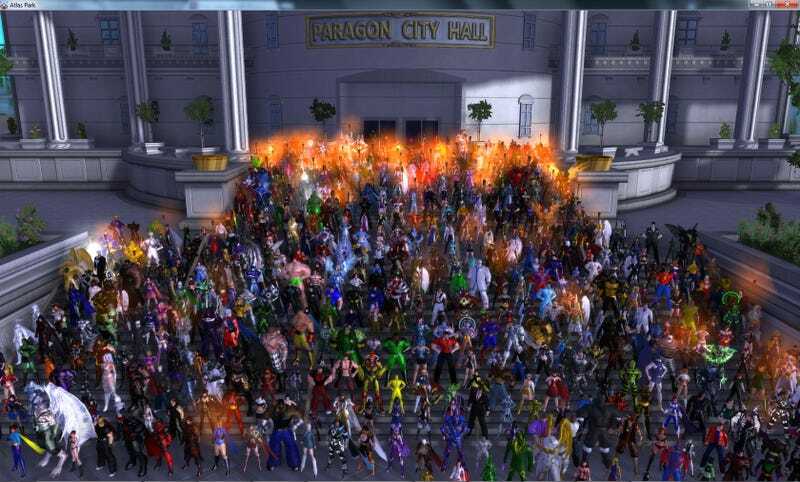 The City of Heroes community has called for a massive demonstration at 5 p.m. EDT in Atlas Park to protest the MMO's shutdown. [Update] But apparently it's already begun. That image [h/t mrKetch] shows hundreds now jamming city hall, and reports say the gathering already is large enough to bring down servers. [Second Update] With the protest underway, reader LeandroTLZ reports that there are 31 instances of Atlas Park, 30 of them completely full, meaning at least 2,500 players are now participating in this demonstration. [Third Update] The City of Heroes community asked Kotaku to change the headline of this item and note that this was organized as a show of support called "The Unity Rally," with participants asked not to use emotes like protest signs or angry speech. While torches were visible, which some took as the sign of a mob, it was intended as a vigil. The rally was not intended to be a denial-of-service protest.